The New York Times just released its annual 10 Best Illustrated Children’s Book list and, as usual, it contains some interesting, quirky and thoughtful choices. Of particular note: both the illustrator and author of one of the 10 choices – Christian Robinson and Mac Barnett – visited our library recently to talk about the book, which is titled Leo, A Ghost Story . One other note: Barnett is the author of another of the 10 books on the list, The Skunk, which was illustrated by Patrick McDonnell. On the occasion of Mac's last visit we posted a list of the Mac Barnett books we have in our library collection. They are quite diverse, including both picture and chapter books. LEGO Club is Sunday, November 1. Drop in from 1:30-3:00 to play with a variety of LEGO, including Duplos. The target age of this free play program is 3-10. Registration is not required but it keeps you up to date with program goings on. The earlier program, 7-7:45 is for children 5-7. The second program, no-holds-barred traditional tales, is for kids (and adults) 8 and up. No Comics Jam today 10/20. The next one is planned for November 10 at 4 pm. Halloween and Fall Crafters are invited to BYOP. That's bring your own pumpkin to decorate with washi tape! Wednesday Oct 21 7:30pm - Author Gabrielle Balkan presents The 50 States, a new collection of fact-filled, illustrated maps for kids. This more-than-an-atlas offers maps of each state as well as introductions full of cultural and historical information about what makes each one unique. Timelines detail a variety of important events ranging from hugely influential to downright quirky, and children’s book authors and illustrators from across the country are given special prominence throughout the pages. Politics & Prose will be selling copies of the book, but the program is free and no purchase is required to attend. We have 9 books by Mary Downing Hahn in our library catalog. One of these, Wait Till Helen Comes, has recently been made into a movie. Hahn is a Maryland author (and librarian!) Here is list of some children's books set in this area. 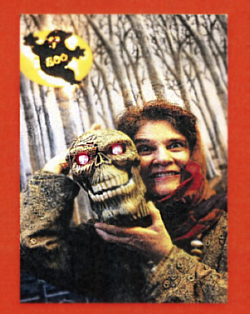 Another scary book by a Maryland author/librarian? Blood and Chocolate. Our Comics Jam program, scheduled for Tuesday October 13 at 4 p.m., is postponed until next Tuesday October 20 at 4 p.m. Join us then for a fun program devoted to reading comics together! The story program that was scheduled for 10/13/15 has been canceled. All those registered have been notified by e-mail. This also helps us to estimate supplies/seating if the program involves food or crafts or just space. A New Rangers Book ! Tuesday Oct 13 7:30pm – John Flanagan, internationally best-selling author of the Ranger’s Apprentice and Brotherband series, spotlights his new book, The Tournament at Gorlan. This event will take place in the Takoma Park Community Center auditorium. The new book is a prequel to the Ranger's Apprentice series and features the characters Halt and Crowley. We have 18 titles by John Flanagan in the library collections. He is one of our most popular authors. Tuesday, Oct. 6, 7 p.m. – Illustrator Matt Davies discusses his new picture book for children, Nerdy Birdy. Creepy Carrots fans: the writer for Nerdy Birdy is Aaron Reynolds who has written several popular picture books including Carnivores, Chicks and Salsa, and Here comes Destructosaurus! Love illustration? Use twitter? or tumblr, instagram, facebook, flickr, pinterest ? Keep your eye on #inktober this month. Monday Oct 5 7:30pm – Graphic novelist Ben Hatke, known for his Zita the Spacegirl books, returns to Takoma Park. He will introduce has newest book for kids, the absolutely delightful Little Robot.